Don't be FOOLED by cheap Chinese knockoff paper, which sell for quite less, and may contain toxic chemicals. Here we carry only American made, Verifone vx520 thermal paper rolls for your terminal. At Terminaldepot you will receive nothing but the best, and finest paper. Which has been personally verified by our employees to fit. 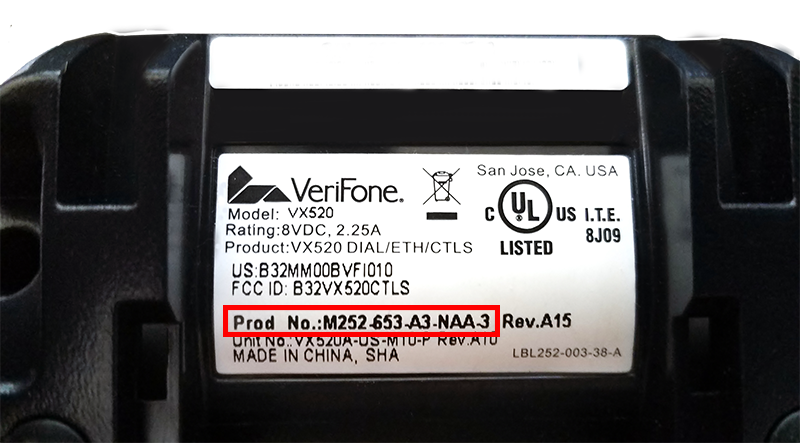 Note: If your machine uses a thinner roll, or Prod No beginning with M252-653... Then your vx520 terminal contains a contactless chip reader. Requiring it to use a smaller size roll found here. The VeriFone vx520 is a reliable, rugged counter top device that's built to last. It handles encryption, decryption and processing at lightning speeds thanks to its powerful processor and expandable memory. Integrated capabilities support alternative payments and also supports value-added applications such as loyalty or gift card acceptance. If you are not sure what you need, please Contact Us. A lot better product than the cheaper ones I ordered on eBay, and Amazon. Extremely fast shipping. Amazing customer service, quality product, low price! Being the first time, I placed an order with them, a rep had called me to verify if I had ordered the correct paper size. Unknown to me that there were a few different models of the vx520 that each use a different size paper. To my surprise I had ordered the wrong size paper for my version of the vx520. Thanks to their detail knowledge, they quickly corrected my order, and shipped the product out the same day with fast shipping. Fyi the 85' length is too large for the Verifone vx520. There are a few different variations of the vx520, which use different size rolls. If you are looking for the shorter rolls they can be found in the Description section below.